1.2 These services include, among other things, access (i) to the various Games published by the Company (DOFUS, WAKFU, KROSMASTER ARENA, DOFUS TOUCH, KROSMAGA, hereinafter the “Game” or “Games”), (ii) the discussion forums available on the Company's websites (hereinafter the “Forums”), (iii) the mobile application Ankama Authenticator, and (iv) Ankabox. To access certain Games (DOFUS, WAKFU, KROSMASTER ARENA, DOFUS TOUCH and KROSMAGA), the Company may ask you to download and install software on your terminal (hereinafter the "Client" or the "Clients"). These TOU also govern the use of these Clients. The Games, the Forums, the Ankama Authenticator mobile application, the Ankabox and the Clients are collectively referred to as the "Services". 1.4 As such, the TOU determine the framework of contractual relations between the Service user (hereinafter "you") and Ankama. 2.1 You acknowledge that you are an individual who has reached the age of majority in your country of habitual residence or, if you are a minor and the law of your country of habitual residence so requires, you have obtained permission from your legal representative (parent or guardian) to create an Account and/or access the Services. You also acknowledge that you are capable of entering into a valid agreement in accordance with the law, case law or customs of your country of habitual residence. If you live in the United States and are under 13 years of age, CAUTION! You may not create an Account and access the Services. If you are aged between 13 and 18 years, then you must obtain consent from your legal representative (parent or guardian). 2.2 Any use of the Services which is not in accordance with the TOU is prohibited and may lead to the termination thereof, in accordance with the terms set forth in Article 14 hereinafter. 2.3 Acceptance of the TOU is established by your electronic signature, manifest by your having checked the box provided for this purpose or by your having clicked on the TOU acceptance button or on the button allowing you to finish creating your Account. This acceptance is required to create an Account and/or use the Services and/or download the Games. If you disagree with these provisions, you must not check the box or click on the TOU acceptance button. In the event that the TOU are updated, you will be asked to manifest your agreement by filling a check box or clicking on a TOU acceptance button, failing which you may no longer access the Services. 3.1 As the Service is offered on the Internet, you must have an Internet connection to access it. All costs of telephone connections and Internet access are at your expense. Ankama shall bear no liability for damage you may suffer as a result of using an Internet connection or as a result of malware being installed on your computer. 3.2 Certain Services are accessible via mobile devices. "Mobile device" refers to any mobile device capable of connecting to the Internet to access the aforementioned Services (mobile phones, tactile tablets, personal digital assistants, etc.). You acknowledge that the quality of the Services, the response time, and the access to certain functionalities may depend on the capabilities of your mobile device and of the electronic communication network. You acknowledge that the Services offered on mobile devices by Ankama may not be available on all mobile devices. 3.3 Ankama grants you a limited, non-exclusive and non-transferable license to access and use the Services and their content. This license is subject to compliance with the rules set forth in the TOU. 3.4 To access the Services and/or all of the Services' functionalities, the Company may ask you to create an Ankama account (hereinafter the "Account"). You can create an Account from the sections provided for this purpose on Ankama websites (hereinafter the "Websites"), found in the "Create an Account", "Subscription", and "PLAY!" sections. 3.5 Certain Games are accessible without having to fill in the Account creation form. In this case, a guest account shall be automatically created to allow you to save data linked to the Game you wish to access, such as your progress (hereinafter the "Guest Account"). Please note that for certain Games (such as the browser-based DOFUS game), the Guest Account will not allow you to access all of the functionalities of the aforementioned Games. To obtain comprehensive access, We will ask you to register an Account by filling in the Account creation form. Insofar as they are compatible with the provisions provided for by the TOU, the rules concerning Accounts are applicable to Guest Accounts. By way of example, the sanctions provided for in Article 10 of the TOU are applicable to Guest Accounts. 4.1.1 To create an Account, you must be a person aged eighteen (18) years or have reached the legal age in your country of residence or, if you are a minor and the law of your country of habitual residence demands it, obtained the agreement of your legal representative (parent or guardian), and in any case, be legally able to enter into an agreement with the Company. Reminder: if you live in the United States, you may not create an Account if you are under the age of 13. 4.1.2 The Account is a user account made available to you via an account name and password. 4.1.3 The Account remains the property of the Company. You only hold a right of access to the Service, through an Account provided to you. The first time you access the Service, you will be asked to enter a nickname. 4.1.5 The Account and your personal details are managed solely via https://account.ankama.com/en/login. 4.1.6 The Account name (or login) and password allow you to access the Services. The email address allows us to communicate with you to manage and monitor your Account, and to send you information relating to the Services. Personal details must be accurate, verifiable, complete and up-to-date. A valid personal email address must be provided. You agree not to use intermediary servers (also called proxies), whether for Account registration or connecting to the Account. Automatic Account creation and/or Account creation using a false or fraudulent identity is strictly prohibited. If any of your information changes, such as your mailing address or e-mail address, you must notify the Company as soon as possible. 4.2.1 Account names are not visible to other users. Nicknames differ from Account names and are visible on Forums and in-game. The owner of an Account is known to other users through his/her nickname. The nickname identifies you as a person. In the Games, the character nickname is complementary to the Account nickname. It is visible to other users. The character nickname corresponds to the role you play in-game. The guild name and team name are visible to other users in-game. not combine your first and last names, which, when put together, would contravene the rules listed above. Assessment of compliance or non-compliance with these provisions (in particular, compliance with the provision in relation to resemblance between Account names, nicknames, character names, guild names, team names, or other terms) is at the Company's discretion. allow Ankama to easily contact you, for any reason whatsoever, via your email address. 4.3.2.1 The security of your Account is solely your responsibility, and Ankama shall not be held liable for damages that may result to your Account or your computer after losing or sharing your Account login details. 4.3.2.2 The Company shall not in any way be held responsible in the case of Account theft or any changes that may result to your Account. 4.3.2.3 You also acknowledge that you are presumed to be the user of your Account, and, as such, are responsible for actions taken through the use of your Account and on your Account. 4.3.2.4 You acknowledge that you, and not the Company, are responsible for all electronic communications and content sent from your computer, and that you must only use the Services in compliance with the law and the TOU. When you make your first payment using your Account (buying your first subscription, your first Ogrine pack, or your first Starter Pack), the Company will ask you to certify your Account. Account certification is mandatory. In order to certify your Account, you must provide the information listed in Article 4.1.8. If your Account is already certified, Ankama reserves the right to ask you to confirm, by all means necessary, your first name, last name and date of birth, and indicate your country of residence, mobile telephone number (or landline number if necessary) and secret question and answer. Please note that all information you provide as part of these TOU must be accurate. Subject to the provisions of the TOU, the Company grants you a non-exclusive, non-transferable, revocable, limited license allowing you to access and use the Games and to download, install and use the Clients for your personal, non-commercial use. You acknowledge that the use of techniques to connect to the Games other than those provided by Ankama or one of its partners is prohibited. Conditions specific to the Clients: The Company authorizes you to install the Clients on any machine that you own or for which you have the right to install computer programs and store the files in question. The license granted to you is subject to certain limitations. Any use of the Games and/or Clients that does not comply with the rules of Article 5.2 shall be considered to be a breach of the Company's copyright. 5.2.1 You may not reverse engineer, disassemble, decompile, edit or otherwise modify all or part of the Clients or Games, unless expressly permitted to do so by Ankama or the legislation in force. 5.2.2 You may not modify the Games or Clients (with the exception of updates). You may not modify, or cause to be modified, any files that are a part of the Games or the Clients in any way not expressly authorized by the Company, and you may not make any derivative works of the Games. 5.2.3 You agree not to use or create pirate servers, proxies, emulators or any other elements of this type to connect to the Games. You may only use the tools and methods offered and accepted by the Company to connect to the Games. 5.2.4 You may not use the Client to develop any computer program. 5.2.5 You agree not to create, use, advertise, or promote any program or tool capable of causing damage to the Games or the Clients, or of altering the experience of the Games, including (but not limited to) bots, viruses, Trojan horses, piracy tools, cheats, automation software, mods, or any other unauthorized software intended to modify the Games or the Clients. 5.2.6 You agree not to intercept or spy on the communication protocols used by the Company, nor to use an interceptor for the data or the protocol. As such, you may not emulate these protocols, collect data via packet-sniffing, or transfer these protocols or data to another protocol (tunneling). 5.2.7 You shall not develop or distribute modifications to the Clients using the features provided for this purpose in the form of modules (hereinafter the "Module" or "Modules") where the Company has not explicitly authorized the development thereof and published the related licensing agreements, nor develop or distribute Modules using other features, techniques, methods or functions other than those explicitly documented by Ankama. Any Module developed, distributed or used through the Client must be subject to a license for the development and use of Modules. 5.2.8 You cannot resell all or part of the Clients and their accompanying files. Generally, you undertake not to use and exploit the Games and/or the Clients for any commercial purpose. 5.2.9 You agree not to distribute, even free of charge, all or part of the Clients and the accompanying files without the prior written permission of Ankama. 5.2.10 You agree not to create, use, or disseminate any program not distributed by Ankama which could be used to modify the characteristics of your Account or that of a third party, or which could adversely affect the servers or infringe on the interests of the Company. 5.2.11 You may not use the Games in any manner that could render them inaccessible, damaged, or inoperable. 5.2.12 As an exception to Articles 5.2.1, 5.2.2, 5.2.7 and 5.2.9 hereof, Ankama may make tools available that shall allow you to modify the theme of the user interface included by default in the Clients (hereinafter the "Pre-Existing Theme") as well as to modify a theme already modified by another user of the Services (hereinafter the "Personalized Theme") then to share the theme thus modified to other users of the Services. You undertake not to create and/or share a Personalized Theme likely to harm the rights of third parties (image rights, privacy rights, intellectual property rights, or any other rights). You undertake not to create and/or share a Personalized Theme that could be considered to be illegal, aggressive, defamatory, pornographic, obscene, vulgar, racist, hateful, malevolent, sexually explicit, violent, or contrary to public order. You are prohibited from creating and/or sharing a Personalized Theme likely to cause damage to the Games, the Clients, Ankama or other users of the Services. You undertake not to include advertisements in the Personalized Theme. Sharing a Personalized Theme can only be done free of charge. You are strictly prohibited from asking for compensation from other users of the Services, in any manner whatsoever, for the use of a Personalized Theme. The creation, use and/or sharing of a Personalized Theme does not give you any right to any remuneration from Ankama. You are solely responsible for hosting the Personalized Theme and related costs. If your Personalized Theme is a protectable work, you agree to grant Ankama, free of charge and for the whole world, a non-exclusive, irrevocable, transferable and perpetual license or for the duration of the literary and artistic property applicable in your habitual place of residence, to reproduce, represent, adapt, copy, repair, cite, publish, use, transform, translate, archive, preserve, modify, create derivative works of, transfer under license or sub-license, sell, market, distribute, transmit, diffuse and communicate in any other way, and display and execute publicly all or part of a Personalized Theme in any way, in any format and on any medium whatsoever, existing or future, and for any reason whatsoever, and in particular, to promote the Services or promote your Personalized Theme. You guarantee that you have the full use, free of any limitation of the rights conceded against any disorder, claim or eviction, as well as against any defamation and harm to good moral decency. You declare that you are sole owner of the rights attached to the modifications made to the Pre-existing Theme and that you have full power and capacity to grant the rights thereof; that you have not granted nor shall grant, during the period of the granted license, rights that may compete with those granted above. If your Personalized Theme is a protectable work, you grant to all other users of the Services the right to use, copy, modify, display, execute, create derivative themes and communicate in any other way and share the Personalized Theme. You undertake to compensate Ankama against any appeal, legal action, dispute, claim, action and/or request for damages that any third party could form in any respect whatsoever against Ankama, due to the non-compliance with any of your obligations, statements and/or guarantees pursuant hereto. Ankama reserves the right (but is not obligated) at any time to prevent the use of one or more of the Personalized Theme(s) hosted on a particular Website, for any reason whatsoever, in particular if this or these Personalized Theme(s) and/or the said Website violate(s) the terms of the Agreement. You agree to only use the tools made available by Ankama for the installation of the Personalized Theme. Your attention is drawn to the fact that Ankama does not host Personalized Themes and has no control over their content. Thus, Ankama cannot be held responsible in the event of a breach of one of the rules in Article 5.2.12.1 by the user who created and/or shared the Personalized Theme. In particular, the responsibility of Ankama cannot be sought if the downloading, installation and/or use of a Personalized Theme causes you any damage whatsoever. 5.3.1 You agree to refrain from insulting or threatening other users or Company staff, and to refrain from all racist, shocking, offensive or discriminatory speech, and from any speech that is illegal under French, European or international law, irrespective of the language used. Ankama cannot be held liable for any violation of the present article. 5.3.2 You also agree to refrain from: "spamming", "flooding", or sending commercial offers of any nature to other users; cheating, stealing Accounts, characters or items from any Account, or attempting to do so; threatening, harassing or embarrassing other users by any means whatsoever; providing other users with personal information about yourself or other players; and collecting information in the Games. 5.3.3 You are prohibited from proceeding with any form of advertising or in-game commercial promotion via the communication means put made available to you in the framework of the Games. Ankama may nonetheless authorize, at its sole discretion, the dissemination of fan websites and other guild forums, in relation to the Ankama game universe, provided they do not contain any content that may contravene legislation in force and the TOU. 5.3.4 In the Games, each discussion channel has its function. You agree to use the discussion channels in accordance with their purpose. The inappropriate use of chat channels may be sanctioned, especially when done in an abusive and deliberate way. 5.3.5 You are prohibited from selling or exchanging, in the Games, on the Forums, or anywhere else, Audiotel codes acquired on the Websites. 5.3.6 Your public written communications may be recorded, analyzed, or erased by the Company so that it can ensure your communications comply with legislation and the TOU. You acknowledge that you, and not Ankama, are responsible for all intra-game communications and content sent from your computer and that you must only use the Games in accordance with legislation and the TOU. 5.3.7 You agree not to use loopholes, bugs or any other type of error to obtain advantages in-game (including, but not limited to, gaining experience, gaining items, gaining time, bypassing restrictions, duplicating items or kamas), nor to promote the use of these. Similarly, you undertake to immediately notify Ankama's Support when you notice a loophole or error in the Games. 5.3.8 You agree not to participate in, organize, or be involved with an attack against Ankama's servers. 5.3.9 Generally, use of the Services must not violate national and international legislation and regulations. All elements that you may obtain in our Games, whether bought by you or obtained by you following your use of our Games or in exchange for rights to use Ogrines, Goultines or Kamas that can be used only in the KROSMAGA game shop (hereinafter the "Krosmaga Kamas"), including, but not limited to, game characters, all virtual items linked to your game character(s) (equipment, mounts, pets, sidekicks, living items, scrolls, resources, etc. ), Kamas, virtual Krosmaster figurines, virtual cards from the KROSMAGA game (hereinafter collectively referred to as the "Game Elements") are associated with your Account. You acknowledge that the Game Elements are and remain the exclusive property of the Company. The issuing of Game Elements by the Company is strictly personal and limited to the experience in the Games. The Company exclusively gives you a right of use over the Game Elements; it does not involve a transfer of ownership, which you expressly acknowledge. Thus, this right of use shall be terminated no later than upon closure of your Account for any reason. You acknowledge that the Game Elements have no financial value in the real world. It is strictly prohibited to exchange them for real money. Generally, the loaning, sharing, exchange, donation, purchase, transfer, and sale of Game Elements (or attempts to do so) outside of the Websites, the Games and their rules, are strictly prohibited and may give rise to sanctions on your Account. Due to the constant development of the Games, and in particular to ensure the most balanced experience possible between players, Ankama reserves the right to modify or delete Game Elements. In order to improve the experience in the Games, Ankama reserves the right to issue updates or patches to the Clients and the Games (hereinafter the "Updater"). For these updates and patches to be effective, and so you can continue to play the Games, you agree to install these Updaters. The Games, the Clients, and their updates constitute an indivisible whole, inseparable from their components, which remain subject to the TOU. 6.1 The provisions of this Article are applicable to all Forums edited by Ankama that contain a link to the TOU. In the event that this Article conflicts with the specific rules, the specific rules shall prevail and shall supersede the provisions of this Article. 6.2 You undertake to write using proper, comprehensible language and not to use "SMS language" or "textspeak". 6.3 For your own protection, you undertake not to share your personal information or your Ankama Account login details and password on the Forums. 6.4 You are prohibited from usurping the identity of a third party and, in particular, from presenting yourself as an employee, representative, moderator or other person linked to or affiliated with Ankama and its partners. 6.5 You undertake to respect other users, moderators, in-game hosts and Ankama staff. Disrespectful comments, including, but not limited to, comments that are insulting, obscene, racist, defamatory, homophobic, or xenophobic are strictly prohibited. Ankama cannot be held responsible for any breach of this Article. Furthermore, threats to the physical integrity of an individual may be reported to the relevant judicial authorities. 6.6 You undertake to read all contributions to a discussion thread before replying to it. 6.7 You undertake to use the search tool before creating a new discussion topic. If a discussion thread is already open regarding the same subject, it is preferable to respond in this discussion thread rather than create a new one. You undertake to use the appropriate Forum section that corresponds to the subject of your message. 6.8 Publishing or promoting content that is illegal, threatening, harassing, defamatory, vulgar, obscene, hateful, racist, pornographic, or objectionable is prohibited. In particular, promoting any form of cheating, modification of the Games' Clients, phishing sites, sites selling virtual items, or sale of Ankama Accounts is prohibited. Promoting third party products and services is prohibited, whether for commercial gain or not, without the express authorization of Ankama. 6.9 Damaging, or attempting to damage, the integrity or proper operation of the Forums in any manner whatsoever is prohibited. 6.10 Disclosing improper conduct which fails to comply with the TOU by citing details such as the Account nickname or the character of another user is prohibited. 6.11 Sending a high volume of private messages to other users or Forum administrators is prohibited. 6.12 Sending unsolicited messages is prohibited, as is writing irrelevant comments. Practices that consist of willfully rehashing discussions, without contributing any new information, or where the topic has become obsolete, are also prohibited. Without authorization from the Company, creating a discussion topic to carry out a survey or to start a petition is prohibited. 6.13 Disclosing private communications between you and Ankama is prohibited. This includes messages dealing with issues such as bans, Account closures or deleted messages, which are prohibited. 6.14 Ankama shall bear no liability for any problems encountered by visiting certain websites as a result of clicking on links posted on the Forums. Visiting such websites is entirely at your own risk. 6.15 We reserve the right to edit or delete your messages if the content thereof is deemed inappropriate, and we refuse any liability in relation thereto. 6.16 Replying to individuals who do not comply with the rules of this Article is prohibited. The Ankama Authenticator is a mobile application, available on compatible mobile devices, which reinforces the security of your Ankama Account (hereinafter the "Authenticator"). Please read the "Ankama Authenticator" section on the Support website (https://support.ankama.com/hc/en-us/sections/200297533-Ankama-Authenticator) for more information about how the Authenticator works. A tutorial is also provided as part of the application. know the answer to your secret question. Before activating the Authenticator, please ensure that all of the details provided in your Account are accurate. If this is not the case, Ankama will be unable to assist you should you encounter a problem when using the Authenticator. the latest version of the Authenticator will always be compatible with your version of the operating system or with your device. In this case, Ankama will alert you, by any means it deems appropriate, that an update to the Authenticator may lead to incompatibility with certain versions of an operating system or certain devices. use of a version of an operating system not recommended by Ankama (view the recommended versions here: https://support.ankama.com/hc/en-us/articles/205082217-How-to-download-the-Authenticator-). Ankama may not be held liable if one of the above situations results in the Authenticator malfunctioning. The Company claims no right of ownership over the content of any messages you send via the Ankabox service. The Company does not access your messages, except out of technical necessity to provide the messaging service. The Company may carry out automatic operations across the entire Ankabox service in order to improve this service or the experience offered by any of the Games it publishes. generally, use the Ankabox service for the purposes of harming the Company and/or any persons, and/or disrupting their peace. This Article concerns your use of Ogrines, Goultines and Krosmaga Kamas (hereinafter collectively referred to as the "Credits"). These conditions apply to you once you access these Credits, and whatever their method of being obtained (including, but not limited to, via the purchase of packs of Ogrines or Starter Packs on the Websites or on the websites of our partners distributing the Games, via the purchase of packs of Goultines in the DOFUS TOUCH game, via the purchase of packs of Krosmaga Kamas on the Websites or in the KROSMAGA game, as part of promotions, tournaments or competitions, as a reward or a gift, via Ogrines cards sold or offered during special events or on the website www.ankama-shop.com or for Ogrines, in exchange for the rights of use over Kamas in the DOFUS game). Your attention is drawn to the fact that, according to the method of obtaining rights of use over Credits, additional special conditions may apply, in particular restrictions regarding the scope and duration of these rights. These special conditions may feature in sales conditions or be given to you via information provided before their purchase. In the event of a contradiction between these special conditions and Article 9 of the TOU, the special conditions shall prevail. The fact that a stipulation featuring in Article 9 of the TOU is not expressly mentioned in the special conditions does not mean that it contradicts the aforementioned Article 9. 9.1 Right of Use: Ankama allows you to acquire rights of use over Credits. The rights of use over Credits allow you to access content made available to you by Ankama on the Websites and/or Games. The content to which Ankama allows you access in exchange for Ogrines, including subscriptions, booster packs, services that can be used within certain Games, and rights of use over virtual objects, over Krosmaster virtual figurines or over Kamas that can be used in the DOFUS game, in exchange for Goultines, including rights of use over virtual objects or services that can be used within the DOFUS TOUCH game, or in exchange for Krosmaga Kamas, including virtual cards (in the form of boosters or decks) or services that can be used within the KROSMAGA game, is called "Exchange Content". Whatever the terminology used, Ankama only supplies a right of use over Credits and not a right of ownership, which you expressly acknowledge. You acknowledge that the Credits have no financial value in the real world and in no way constitute money or goods of any kind. The Credits may only be converted into Exchange Content. You are therefore strictly prohibited from exchanging them for real money or for goods and services other than Exchange Content. You must in no way transfer, sell, or otherwise exchange (or attempt to do so) the rights of use over Credits outside the Websites, Games and their rules. Ankama can remove Credits obtained outside the services approved by Ankama from your Account at any time, without prior warning. 9.2 Exchange Content: Ankama reserves the right to add and/or remove elements making up the Exchange Content and/or to modify their characteristics at any time without prior warning. Ankama also reserves the right to modify the quantity of Credits needed to purchase an element of the Exchange Content at any time, without prior warning. Once you have converted your rights of use over Credits into Exchange Content, this content cannot be exchanged for rights of use over Credits or money, or for other goods or services. The exchange is firm and definitive. Please note that certain elements that make up the Exchange Content may have an expiry date. In any case, as the Exchange Content is associated with your Account, you shall no longer have access to this content if your Account is closed, for whatever reason, without you being able to claim any damages of any kind whatsoever. Your attention is drawn to the fact that some elements that make up the Exchange Content can be linked to your Account for a certain time and therefore cannot be the subject of an exchange with another player. This is the case with items purchased from the DOFUS and DOFUS TOUCH game shops that are linked to your Account for a period of two (2) months from their purchase. 9.3 Duration: Unless otherwise specified (including if the rights of use over Ogrines have been obtained via the Kama Exchange), the duration of the rights of use over Credits starts on the day you obtain the Credits and ends on the earlier of the following two dates: (1) on the day your Account is closed, for whatever reason; (2) at the end of the period provided for in the General Conditions of Sale applicable when you order the Credits, where appropriate. 9.4 Special Conditions of the Kama Exchange (applicable only to Ogrines in the DOFUS game): In the DOFUS game, the exchange of rights of use of Kamas and rights of use of Ogrines is made on the Kama Exchange. The amount of the exchange is fixed freely by the players. The rights of use over Ogrines purchased in exchange for rights of use over Kamas cannot be the subject of an exchange with another player through the Kama Exchange. You can, however, benefit from all other services offered by the Company in exchange for rights of use over Ogrines, not involving other players. If you obtained your rights of use over Ogrines in exchange for rights of use over Kamas, the duration of the rights of use over these Ogrines begins on the day when the Ogrines are credited to your Account and ends on the earlier of the following two dates: (1) the day your Account is closed, for whatever reason; (2) ninety (90) days after the Ogrines have been credited to your Account. 10.1 In the event that one or more of the provisions of the TOU or of any other document incorporated herein by reference is violated, Ankama reserves the right to terminate or limit, without prior notice and at its sole discretion, your use and access to the Services, to your Account, and to all Ankama Websites, and to sanction you concerning the Games. Sanctions are specific to certain Services and, in particular, to the Games and the Forums. In the event of a contradiction with this Article, the specific sanctions shall take precedence over the TOU. Warnings: Warnings have no direct consequences for the Account. You may continue to use the Services without any change. Warnings exist primarily to warn you that you are at risk of greater sanctions if you continue to breach the rules set out by the TOU. One-Day (1-day) Bans: One-day bans are usually used in the event of a first substantial infringement of the TOU. This is the first step that can be applied on the Account ban scale. Three-Day (3-day) Bans: Three-day bans are usually used in the event of repeat offenses. Three-day bans allow us to make you understand that you incur real risks by not complying with the TOU. Seven-Day (7-day) Bans: Seven-day bans are usually used in the event of severe breaches. Fifteen-Day (15-day) Bans: Fifteen-day bans are the most serious sanction before the definitive closure of the Account. When an Account is suspended for fifteen days, your conduct thereafter must be beyond reproach, otherwise, you risk being banned permanently. Definitive Bans: The Account is closed permanently, and you can no longer access it. This sanction is usually applied in the event of repeat offending or of serious or unforgivable infringement of the TOU (notably, in the event where payment has been made without the permission of the individual owning the means of payment). 10.3 Ankama reserves the right to impose any sanction referred to in this paragraph on an Account, taking into account the seriousness of the breach, without necessarily first giving prior warning or applying a penalty of shorter duration. You agree that these sanctions are final and you cannot in any way challenge the decisions taken by Ankama. 10.4 Ankama also reserves the right to change Account names, nicknames, character names, guild names, and team names that do not comply with the rules set forth above, as well as those that are deemed unsuitable by Ankama. Ankama may, where appropriate, temporarily or permanently suspend access to the Account or delete a guild or team name, without compensation. 10.5 Ankama reserves the right to suspend all of your Accounts permanently, depending on the seriousness of the infraction. 10.6 In addition to the sanctions described above, Ankama may take appropriate sanctions, including civil prosecution and criminal proceedings against the offender. 10.7 If Ankama notices suspect or abnormal behavior or operations on your Account, which may lead to a breach of the TOU, Ankama reserves the right, at its sole discretion, to block your Account for the time needed to perform verifications or an investigation. Ankama will decide, at its sole discretion, to provide you with compensation, or not, if your Account is blocked. 10.8 If you have acquired, directly or indirectly, in-game items or money in a fraudulent manner (in particular through exploits, bots, cheating, farming, or theft), Ankama reserves the right to access your Account and delete all or part of your inventory. Likewise, Ankama reserves the right to modify all of your characteristics (including your level, characteristic points, spell points, etc.) if it is proven that you have benefited from a loophole or any other techniques allowing you to increase your characteristics in a fraudulent manner. 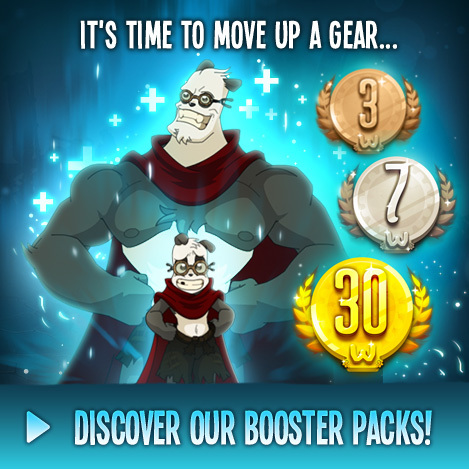 10.9 Except as otherwise provided for in the TOU or through an exceptional arrangement with the Company, there will be no refund if an Account is banned before the end of the subscription period, if Ogrines are still available on an Account, or if you have purchased a Starter Pack or virtual items. 10.10 The act of defaming, injuring, harassing, or threatening a member of staff, a representative, an Ankama moderator or any other person linked to or affiliated with Ankama or one of its partners and service providers, of engaging in behavior or of making remarks that are harmful, violent, obscene, vulgar, hateful, or shocking with regard to these same persons, of invading their privacy or in any other way infringing on their rights, may give rise to sanctions on your Account(s), whatever the means of expression used. 11.1 The Support website (https://support.ankama.com/hc/en-us) is the preferred means of access to the Company's customer service department (hereinafter the "Support") for the Services. To create a request on the Support website, you must create a helpdesk account by providing, in particular, a valid e-mail address. Your request will be recorded in the form of a ticket (identifiable by a 7-figure number). 11.2 Ankama Support will do everything to assist you as soon as possible. Nonetheless, Support reserves the right not to answer a request, notably in the event of non-compliance with the rules of this article. 11.3 Any harassment, threat, insult or other inappropriate behavior with regard the Support representatives will lead to the processing being stopped and may give rise to sanctions in accordance with article 10.10. 11.4 Support provides assistance for problems having an impact on accessibility and/or user-friendliness for players, but is not mandated to respond to issues linked to progress in the Games. 11.5 In the event of identity theft and/or falsification of documents and/or attempt of one or other of these infringements, Support reserves the right to sanction the Account(s) belonging to the fraudster. 11.6 In the event that you suspect any breach of security, including loss, theft or unauthorized use of your login details, or any other problem related to the security of your Account, you will immediately notify the Company via its Support team. Subject to proving your identity, the Company will then reset your password or your secret answer and offer solutions to improve the security of your Account. The Company may also block access to the Account in question, for the time needed to investigate. Following the investigation, Support will settle the dispute at its sole discretion. 12.1 Ankama will do everything possible to ensure the proper operation of its Services and provide you with the Services 24 hours a day, 7 days a week. 12.2 However, in this regard, Ankama is only bound by an obligation of means as regards access to and use of Services. Ankama cannot guarantee that the functionalities offered by the Services will always be available and free of typographical, technical or other errors, that flaws will be corrected, or that the Services or servers hosting them will be free of viruses and bugs. 12.3 For reasons of maintenance, testing, security, repairs, or any other reason, linked to the improvement and/or proper operation of the Services, these Services may be temporarily interrupted by Ankama, without engaging its responsibility. Ankama will, at its sole discretion, decide whether or not to provide you with compensation in the event of interruptions in Services. 12.4 The Company shall not be held liable in the event of force majeure as defined by law. 12.5 Ankama provides the Services while they are published. Ankama therefore reserves the right to cease publishing the Services and consequently to interrupt Services definitively; in the event of this, you will be notified of this by all means. Ankama could also interrupt the Services definitively in the event of a cessation of activity. The service is provided “as is” without any further warranties or any kind. You assume the risk of any and all damage or loss from use of, or inability to use, the service. For minor users, the responsibility rests with their legal representatives. ANKAMA DECLINES ALL RESPONSIBILITY FOR USE OF THE SERVICES THAT IS NOT IN ACCORDANCE WITH THESE TOU. ANKAMA SHALL NOT BE HELD LIABLE FOR ANY DIRECT OR INDIRECT DAMAGES, LOSSES OF DATA OR PROFITS, WHICH MAY ARISE FROM THE USE OR NON-USE OF THE SERVICES, NEGLIGENCE, OR ANY OTHER REASON ASSOCIATED WITH THE SERVICES. ANY AND ALL COMMUNICATIONS BETWEEN ANKAMA AND YOU, WHETHER ORALLY OR IN WRITING, SHALL NOT CREATE ANY GUARANTEE WHATSOEVER NOT SET FORTH IN THESE TOU. Ankama shall not be held liable for any errors or omissions on your part. Ankama shall not be obliged, for whatever reason, to reimburse you in any amount in the event of failure. 12.7 The company shall not be held responsible for links from Web pages or other sites leading to the service, but not managed by the company, or any link contained on the service leading to Web pages or other locations managed and published by others, where the third parties managing and editing the content do not comply with French, European or international regulations. 12.8 Some countries do not allow the exclusion or limitation of liability. Limitations or exclusions might not apply to you. 12.9 SUBJECT TO THE PRECEDING STIPULATIONS, SHOULD THE COMPANY'S LIABILITY BE ENGAGED IN THE FRAMEWORK OF YOUR USE OF SERVICES, THE AMOUNT OF ANY DAMAGES AWARDED TO YOU IS LIMITED TO THE AMOUNT OF THE SUMS YOU HAVE PAID IN THE FRAMEWORK OF ACCESS TO THE SERVICES OVER THE COURSE OF THE TWELVE (12) MONTHS PRECEDING YOUR CLAIM. 13.1 All of the elements, features, tools and documents that are part of the Ankama universe and provided by Ankama (including, but not limited to, the Games, Clients, Updater, Game Accounts, Kamas, Ogrines, Goultines, Krosmaga Kamas and any titles, computer code, themes, items, characters, character names, stories, dialogs, catchphrases, concepts, artwork, animations, sounds, musical compositions, audio-visual effects, methods of operation, moral rights, documentation, in-Game chat transcripts, character profile information, recordings or replays of Games, and server software) are protected by French and international law on copyright and intellectual property. All of these elements, features, tools and documents are the property of Ankama. Unless you receive prior written authorization from Ankama, you undertake not to trade elements from Ankama's creations and not to promote this kind of activity, which harms Ankama's rights. Ankama will do everything to prevent such acts. 13.2 Any data relating to the Games, Services or Websites belongs to Ankama and is protected by French, European and international copyright law. You must therefore respect the prohibitions provided for in Articles 5.2, 5.3 and 5.4. You have no right, in whole or in part, to copy, reproduce, translate, extract, edit the source code, disassemble, decompile, modify, hire, sell, distribute or create derivative works based on the Games or content without Ankama's prior written consent. 13.3 Any trademarks that appear on the Websites or in the Services are trademarks created by the Company or for which it holds the usage rights. You cannot use these trademarks without prior written permission from Ankama. You do not have permission to use meta-tags or any other "hidden text" using Ankama's names and trademarks without prior written permission thereto. Other trademarks appearing on the Websites or in the Games that do not belong to Ankama belong to their respective owners. 13.4 Any non-compliant use ends the authorization or the license granted by Ankama. 14.1 This Agreement shall enter into force on the day of your acceptance, and through to its conclusion, unless either you or Ankama terminate it before this time. 14.2 Termination at Your Initiative: You can request that your Account be closed at any time and for no reason, subject to proving your identity. You must therefore inform Ankama thereof via its Support department (https://support.ankama.com/hc/en-us) by creating a ticket. Subject to compliance with the aforementioned termination procedure, the termination of your Account shall be effective within a reasonable period after receipt of your request by Support. Termination for Misconduct: Ankama may close your Account with or without prior notice, if you do not comply with the law and the rules set forth by the TOU, the General Conditions of Sale (https://account.ankama.com/en/gcs) and by all documents expressly incorporated herein by reference. Ankama also reserves the right to take all necessary measures to cover the damage it may have suffered. Termination for Inactivity: Ankama also reserves the right, of its own accord and at any time, to close inactive Accounts. An Account is considered inactive when it has not been logged into via one of our Websites or Games for a period of twenty-four (24) consecutive months. An Account on which a subscription to the DOFUS game or a WAKFU booster pack is active shall not be considered inactive, even if it has not been logged into for more than 24 months. The period of inactivity shall start from the end of the subscription or booster pack period. At least fifteen (15) days before closing your Account, We will warn you by sending you a message to the e-mail address associated with your Account. 14.4 Consequences of Termination, Irrespective of the Party Initiating such Termination: In all cases, closing the Account will give rise to the termination ipso jure of the Agreement and, consequently, you may no longer access the Services. You must delete the Client(s) from your computer and/or mobile device. In the aforementioned cases of termination, you may not claim any compensation for unused Ogrines, Goultines and Krosmaga Kamas, as well as any non-expired periods on the date of termination, and the rights of use over the Game Elements granted to you by Article 5.4 herein will expire. Some individuals may suffer epileptic seizures when exposed to particular forms of light or flashing lights. Exposure to such forms or such images on a television, or due to playing video games, may induce an epileptic seizure in such individuals. Any person who suffers from epilepsy must consult a doctor before playing. If you experience dizziness, impaired vision, muscular or visual spasms, loss of consciousness, disorientation, involuntary movements, or convulsions whilst playing, stop playing immediately and consult your doctor. 16.1 Divisibility: If any provision or term of this Agreement is determined to be illegal, invalid, or unenforceable, that provision or term will be deleted without affecting the application of the other provisions. 16.2 Absence of Waiver: No waiver by Ankama of any right or any provision of these TOU shall be deemed to be, nor shall it be construed as, a waiver of this right or provision. No Ankama Support representative nor any other member of Ankama's staff who interacts with you is legally empowered to bind Ankama to any amendment or waiver of the provisions of these TOU. 16.4 Changes: Ankama reserves the right to modify, add to or delete any of the rules provided for by the TOU. You will be notified by all means of any substantial changes made to the Agreement when you try to access one of our Services. You acknowledge that, by using the Services after having been informed of the modifications, additions and/or deletions, you accept these modifications, additions and/or deletions. 16.6 Survival of the Terms: In the event of termination of the TOU, Articles 3.1, 5.2, 5.3, 5.4, 12, 13 and 16 shall remain applicable.